Speaking live on WTOP Wednesday, Virginia Gov. Ralph Northam said the four road projects announced Tuesday will help relieve some of Northern Virginia's worst traffic problems — and said the ball is in Maryland's court regarding the American Legion Bridge. WASHINGTON — Virginia Gov. Ralph Northam on Wednesday again celebrated the announcement of four road-construction projects totaling $1 billion, saying that the new highway lanes will help relieve some of Northern Virginia’s worst traffic bottlenecks. “This is over a billion dollars, with a B, of investment in just these four projects. 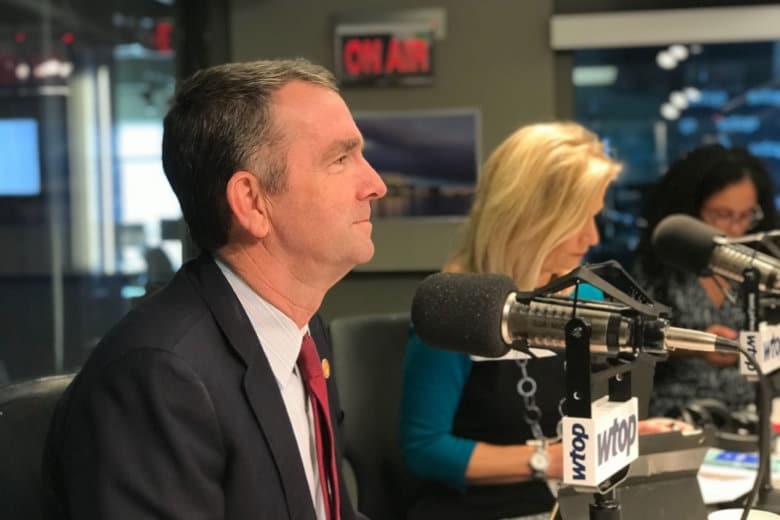 This is a real step in the right direction,” Northam said on WTOP’s Ask the Governor program. Northam recounted the projects announced in conjunction with private partner Transurban — an extension of the 495 Express Lanes north to the American Legion Bridge; a reversible ramp connecting the 95 Express Lanes at Opitz Boulevard, and the finalization of a 10-mile extension of the 95 Express Lanes to Fredericksburg. Transurban will pay for those projects; the state will also build, on its own dime, a southbound auxiliary lane on I-95 in Woodbridge to connect the connect the southbound Virginia Route 123 ramp to I-95 with the offramp at westbound Prince William Parkway. It’ll be paid for in what Northam’s office characterized as “project savings” and won’t require any new tax money. The Occoquan auxiliary lane opened up what the governor called “a tremendous bottleneck,” and could be seen as a move that would take traffic away from Transurban’s toll lanes, so the company thought it was “a compensation issue,” Northam said. The state disagreed, but “we decided this is not something we wanted to argue or discuss for the next 69 years,” Northam said. The governor characterized the new road construction as part of an “all of the above” transportation policy, including roads, transit and more. “Our goal all along has been to move people and move goods as effectively and efficiently as we can,” Northam said. This week, Virginia teachers demonstrated in the streets of Richmond for higher pay and more money for education. One estimate says spending by Virginia is down about 9 percent in the past decade, and teacher pay in Virginia ranks 34th in the nation. A 3 percent pay raise for Virginia teachers is set to go into effect in July. Northam has proposed bumping that raise to 5 percent. While Republicans in the General Assembly broadly agree with the goal, the two sides have different ideas on how to pay for it. The tax bill pushed by President Donald Trump and passed last year will result in an increase in tax revenues in Virginia; combined with other measures such as the internet sales tax, Northam said, Virginia tax revenues last October were up 10 percent over the previous year. “Our revenues in Virginia are doing very well,” the governor said. Northam had sharp words about the effects of the federal government shutdown, which lasted 35 days and ended last week. President Trump shut the government down after Congress wouldn’t approve $5.7 billion for his proposed wall on the southern border, and has said he’ll shut the government down when the current deal expires Feb. 15 if he doesn’t get the money. Tran acknowledged during a hearing that her bill would allow abortions up until moments before birth. But existing state law already provides for abortions throughout the third trimester, if three doctors certify a woman’s health would otherwise be substantially and irremediably impaired. The governor’s favored gun-control measures all failed in the General Assembly, but he continued to support reforms. He noted that 1,028 Virginians died from gunfire last year, and that a number of them resulted from suicides, accidents involving children and domestic abuse. All told, he said, that was more than died on the commonwealth’s roads, and yet discussion and adjustment of laws regarding traffic safety is considered a normal part of governance. Virginia raised its age for tobacco from 18 to 21, and Northam said the tobacco industry recognized the problems posed by young smokers and vapers. “The tobacco industry realizes that ware have a problem in high school,” Northam said, adding that 18-year-olds can buy tobacco and give it to children. “They see it as a problem,” he said of the tobacco companies, and said moving up the tobacco age will help to alleviate that. “Virginia is a low-tax state, but I would be more than willing” to have a discussion on raising tobacco taxes, Northam said, noting that, “you and I end up paying” for medical care for smokers. “We’re … ruining the lives” of people who are “not dangerous to our society,” Northam said.